The purpose of Ocracoke Alive, Inc. is to enrich the Ocracoke Island community by encouraging and sponsoring cultural, artistic, educational, and environmental activities including the production of plays, musicals, musical events, exhibits, schools, workshops, and festivals. 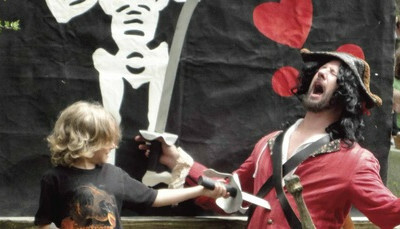 In 2016, the season show lineup at Ocracoke Alive’s Deepwater Theater on School Road includes “Blackbeard: An (historical/hysterical) Account” (Mondays at 7:30 PM), “Ocrafolk Opry” (Wednesdays at 8:00 PM), and “Molasses Creek” (Thursdays at 8:00 PM). For more information on theater tickets and all of Ocracoke Alive’s programs visit www.ocracokealive.org.